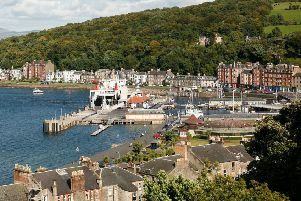 A former Rothesay ferry has been moved to dry dock for repairs after being laid up for more than three years. MV Saturn was towed to the James Watt Dock in Greenock on Wednesday following the announcement by her owners, Caledonian Maritime Assets Ltd, earlier this month that she was to be sold to Orkney firm Pentland Ferries. The ship - the first ferry purpose-built for the Rothesya-Wemyss Bay route, and the last of the upper Clyde’s 1970s ‘streakers’ - had lain out of service at Rosneath in the Gare Loch since September 2011, following her replacement at Rothesay by MVs Bute and Argyle and at Dunoon by the passenger-only service run by Argyll Ferries. Her new career will see her used on freight duties and on work with the renewable energy industry around Orkney and the Pentland Firth.